Home » How To » How To Copy Contacts From Old Phone To Galaxy S7 or S7 Edge? How To Copy Contacts From Old Phone To Galaxy S7 or S7 Edge? If you are Samsung user or an Android user, you probably know how to backup contacts on SD Card or phone storage. But if you don’t know, how to do that, you are at a right place. 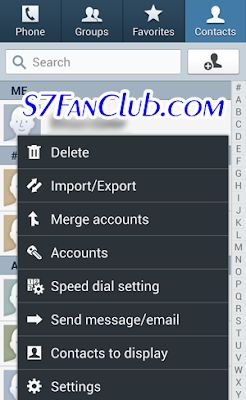 In this tutorial by S7FanClub.com, we will teach you how you can copy contacts from your old Android device to your brand new Samsung Galaxy S7 or Galaxy S7 Edge smartphone. 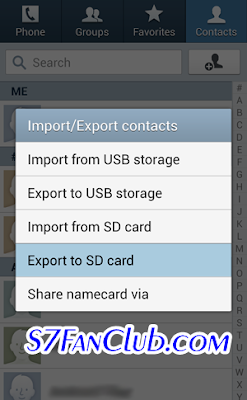 Once your contacts are saved to Contacts.vcf file in /storage/extSdCard/ path. How To Import / Copy Contacts To Samsung Galaxy S7 or Galaxy S7 Edge? You can copy Contacts.vcf file from your old phone to your brand new Galaxy S7 or Galaxy S7 Edge through computer or OTG USB or Bluetooth, or pull out your SD Card and put inside your new phone and can easily import contacts from SD Card exactly repeating the same steps mentioned above, and using the import option. This is the easiest way to move or copy contacts from your old android phone to Samsung Galaxy S7 or Galaxy S7 Edge smartphone. If you do not see an option to Export to SD card then your phone might not be reading your memory card properly. If you do not have a memory card for your phone then I recommend you get one. SD cards can be used to backup so much more than a phones contacts. Not only do memory cards add to the total storage capacity of a phone, but they also allow you to backup your pictures, videos, music, movies, applications, etc.